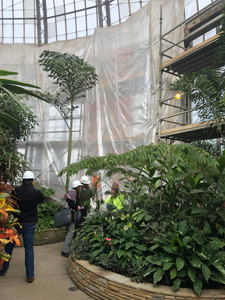 The Anna Scripps Whitcomb Conservatory – a popular attraction at Belle Isle Park in Detroit – is undergoing a major renovation project to help preserve one of the nation’s oldest turn-of-the-century glass houses still in existence. 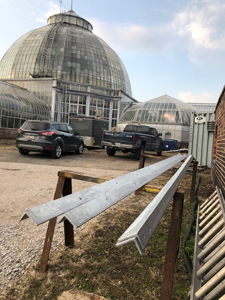 Ideal Contracting, a local Detroit business, began replacing the lower portion of the original steel trusses that support the conservatory dome (also known as the Palm House) in early October. At this time, 10 of the 20 columns have been replaced, with complete replacement slated for May. Significant lead paint abatement is required prior to truss column removal. Areas of abatement are contained, and significant air quality measures are in place to control airborne contaminants. Air quality is closely monitored for the safety of contractors and conservatory staff. To ensure public safety, the conservatory will remain closed until the entire construction project is completed in July. The feasibility of opening the conservatory on weekends, including the Easter Lily Show (April 20-21 and 27-28), will be evaluated in April. It periodically will open on the weekends and holidays as construction conditions allow. Visit the conservatory's Facebook page (Facebook.com/ASWConservatory) to learn about change in hours. Previously reserved events for the conservatory show room will continue to be held during construction. Reservations for new events will not be taken until the construction work is complete. After the lower truss replacement is completed, repairs to the upper truss columns and gutters will continue. Field investigations identified significant additional steel components needing replacement in the upper truss sections of the dome. This project is the first phase of a comprehensive revitalization plan (by the Department of Natural Resources and the Belle Isle Conservancy) for both the Anna Scripps Whitcomb Conservatory and the Belle Isle Aquarium. Upwards of $9 million in additional funds is being sought for significant renovation to the upper portion of the conservatory dome. The $2.4 million project is funded with approximately $1.4 million from DNR parks and recreation capital infrastructure funds and a $1 million grant from the Ralph C. Wilson, Jr. Foundation to the Belle Isle Conservancy. An additional scope of work totaling $550,000 was added to the original contract to fund the current upper truss repairs. For more information, contact Amanda Treadwell, DNR urban field planner, at 313-396-6872 or treadwella@michigan.gov. ConservatoryDome.jpg: Shoring of conservatory dome for removal of column #11. ConservatoryDome.newangles.jpg: New angles for the new truss section.